For the first time in almost four decades, Mrs. Dewson’s Hats at 2050 Fillmore Street wasn’t open in the days leading up to Easter, which is typically prime time for hat buyers. 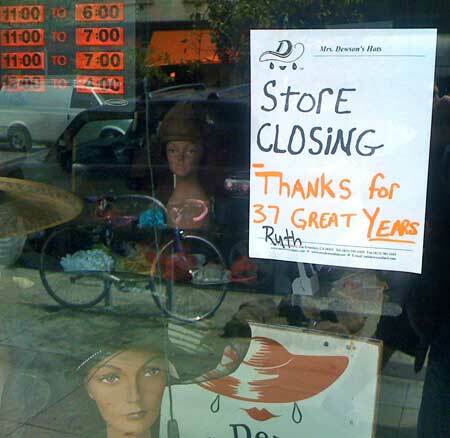 A few days later a sign went up in the window telling the news: After 37 years, Mrs. Dewson’s Hats was closing. And on Sunday afternoon, April 29, the last hats were sold, the final goodbyes said and the doors closed on a prime piece of Fillmore history. “It’s a sad day,” said Glenn Mitchell, nephew of owner Ruth Garland Dewson. “We’ve been fighting it off for a while.” Mitchell has been overseeing the shop since his aunt checked herself into an assisted living facility two years ago. Time and circumstances have taken their toll on Mrs. Dewson, who suffers from dementia, rheumatoid arthritis and other physical ailments. Dwindling finances are another problem. 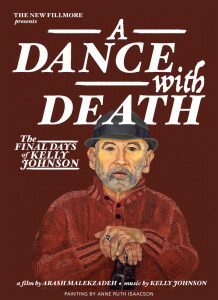 She acts less kindly toward Mitchell, her sister’s son, who has had the difficult job of commuting regularly from Texas during the past two years to keep the hat shop running and look after the affairs of his Aunt Ruth. The youngest of 10 children born in Paris, Texas, to Willie and Elgie Garland, she ran away from home when she was 14 to live with a sister in Los Angeles. She was there for many years, working for the telephone company. Eventually she made her way up to San Francisco and decided to open a hat store on Fillmore Street. Mrs. Dewson, Mr. Kaplan and Fillmore Street all prospered. She became synonymous with the neighborhood. She invented herself as the Hat Lady and crowned herself the Mayor of Fillmore Street. She palled around with society figures and politicians, most especially former San Francisco mayor Willie Brown, for whom she invented the Willie Brim. Even as she became widely known in San Francisco, she stayed close to her family in Texas. She especially liked her sister Sally Mitchell’s son, Glenn, and brought him out to San Francisco for a couple of high school summers. To him would fall the responsibility of caring for her when she slowed down. It has not been an easy job. Mitchell, a software engineer, left his wife and kids back home in Dallas while he kept the hat shop afloat and, after several false starts, found an appropriate new home for Mrs. Dewson. Now that the store has closed, she might move back to Texas. But she’s not ready yet. 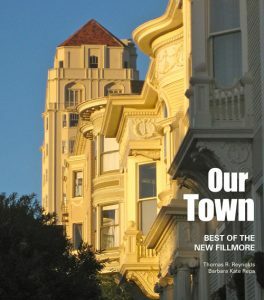 Her nephew vows to honor her legacy on Fillmore. He has already signed up for a prime spot at the Fillmore Jazz Festival in July, which Mrs. Dewson helped start. And business continues at mrsdewsonshats.com. 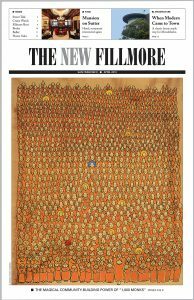 VIDEO: Ruth Dewson, the long-reigning Mayor of Fillmore Street, remembers the pivotal role she played in starting the Fillmore Jazz Festival.